Step through the doors of Flair Boutique and be greeted by a friendly staff in a warm and inviting atmosphere - while discovering the finest in beautiful clothing. Flair Boutique is known for collections of lovely, unique fashion. From gorgeous classic styles for special occasions, to casual chic sportswear for your fun and relaxed lifestyle, Flair Boutique presents fine quality and impeccably designed high fashion merchandise. Adding to your shopping experience, Flair Boutique carries quality jewelry, shoes, belts and handbags to enhance your accessories collection, along with lovely candles, body lotions and perfumes. Personal wardrobe consultations are available by appointment. Flair Boutique Gift Certificates are always a welcome surprise for gift givers seeking just the right surprise for their special someone - and of course, Flair Boutique's signature custom gift-wrap is always complimentary. More than 30 years ago, owner Starr Donati began working with her mother Carolyn at Flair Boutique, located in Lincoln Center, Stockton. 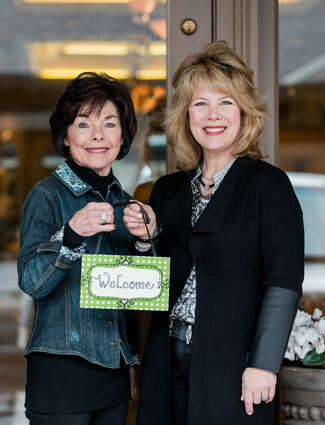 Together they have enjoyed years of buying for, managing and operating Flair Boutique. In 2014 Starr took over Flair Boutique from her mother, although she is still an integral part of the boutique. The boutique completed their expansion in June 2015. Impeccable customer service is what you will receive when you step inside Flair Boutique. In helping with that, Starr and Carolyn give credit to a wonderful, longtime, loyal staff who complete the "Flair Family": Audrey Mazzera, Carol Keaton, Michelle Branson, Jolene Giovannoni, and Cheryl Scatena.